Don’t hide your clutter or feel guilty. Here are 11 reasons why it is so easy to accumulate clutter, and 13 ADHD-friendly rules that will help you to organize your home for good. 1. We have many interests and find it hard to set boundaries (on what we buy, what we keep, and where we put things). 3. We struggle with systems and getting things done, so it’s easy to wind up with stacks of mail or piles of laundry. 4. We keep things because they help us to remember an experience (tickets, programs, souvenirs). 5. We form emotional attachments, making it harder to let go of things (even if we dislike our aunt’s embroidered napkins or struggle to find space to store 200 drawings our children did in grade school). 7. We make impulsive purchases when shopping, because individuals with ADHD are usually in search of ways to stimulate their brains. Buying something new can create a rush of excitement, along with the temporary dopamine flow of contentment. We may fail to think clearly about how, or if, we’ll actually use the new item. This adds to clutter at home. 9. We get distracted and leave things where they were as we move on to something else, whether it is a kitchen counter with the remnants of last night’s dinner or a sofa with piles of magazines on the cushions. 10. We forget — or can’t find — what we have, so we buy extras. 11. Poor time management and lack of interest makes it challenging to follow routines, like emptying a dishwasher to avoid a sink full of dirty dishes or putting away clean laundry before it gets wrinkled. The result? Our home becomes, and stays, a mess. 1. Tone down the emotion. We think, “I really have to straighten up” or “I need to declutter,” which seems overwhelming, and our ADHD brains react by going into the “fight, flight, or freeze” response. When there’s too much to do, we’re likely to avoid doing anything. Start by accepting that the smaller our task, the more likely we’ll get it done. 2. Understand the difference between a task and a project. Organizing a room — or even a closet — is a project. Breaking the job down into baby steps gives us do-able tasks. What are the specific areas that need to be organized? Think of each shelf, surface, or drawer as a separate space or task. Imagine each as a branch on a hybrid fruit tree. Each branch holds a slightly different fruit, and together they are part of the “room tree.” It’s easier to work on one branch then it is to prune the entire tree. 3. Imagine success. Think about how you will feel when you walk into a room that is organized to your satisfaction. Remember how great it feels to invite guests to your de-cluttered home. Think about what a good role model you’ll be for your children, how appreciative your family will be, and how you will feel as you make progress. Forecast this feeling of pride, calm, and comfort, rather than focusing on the stress and discomfort you will go through to achieve it. Think of the current situation as temporary. Accept the fact that things may get worse before they improve. As you organize, look for progress, not perfection; effort, not excellence. It’s better to promise yourself less and deliver more. Relax, breathe, and smile. 4. Create an ‘Organizing Plan.’ Decide on the areas you want to organize. Make a list of the projects (rooms, closets, etc.) and the specific tasks (spaces or things that need to be organized). Don’t worry yet about how you’ll organize — that can stop you before you start. Now decide which areas get priority. If you have difficulty prioritizing, think about where you’ll feel the greatest joy when it’s organized (or where you feel the greatest discomfort now). 6. Create a supportive vibe. This is not an easy process for you, so stop thinking it should be. That’s a trap. Take a walk outside before you begin working. Put on background music that will help keep you energized and focused. Make sure you have sufficient lighting. Stay hydrated and avoid hunger. If you take meds for your ADHD, take them to help with focus and decision-making. Keep the mindset that what you are doing is a gift to yourself and your family. 7. 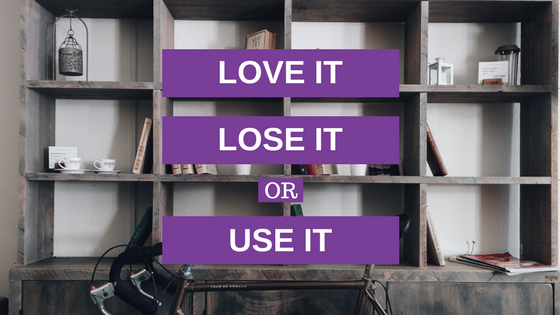 Love it, use it, or lose it. Pick one shelf, one surface, or one drawer. Look at each thing there and ask, “Do I need this? Does it really need me?” Marie Kondo suggests asking yourself, “Does this spark joy in my heart?” Judith Kolberg, founder of the National Study Group on Chronic Disorganization (now called the Institute for Challenging Disorganization) encourages over-personalizing the elimination process, by asking if an item is a friend, acquaintance, or stranger. You keep your friends and get rid of strangers. You enjoy acquaintances for a while, then are happy to see them go. 8. Minimize the sense of loss. If an item is something others might use, either donate it or give it to a friend or family member who would appreciate and use the item. Think of this as blessing someone else with your stuff. 9. Take photographs, then discard, recycle, give away, or donate the object. You can use those photos, whether of memorabilia or art projects, to create photo books or a DVD that you can share with others. 10. Group like with like. As you go through various spaces, group similar items in one area, so you will get a feel for what you have. This makes it easier to decide what you want to keep. Group items by function — how things are used. The book on first aid goes with the first-aid supplies, not with books. 11. Everything needs a home. Decide where the items should live. You might store linens in a central closet, or, for more convenience, in the rooms where they’ll be used. Think in terms of prime real estate. Those items used the most frequently, or those you want to display, should live in your prime real estate. Store the less-used items farther away. The home should be big enough to accommodate the items without stuffing them in (generates a mess), and small enough so you don’t have extra space that could become a haven for clutter. Label everything you can – it’s easy to forget what goes where, and labeling also helps others to maintain your systems. 12. Say “enough.” Set boundaries by deciding (without looking at what you have), how many of a certain type of item you need. If you have limited space to display your goodies, be more selective. When the space is full, it’s time to stop. If you don’t love an item enough to give it priority, then it’s an item you can release. When we have too much, everything loses some of its value. 13. Don’t go it alone. Working with a friend, family member or coach provides moral support, a sense of focus, and an objective perspective (“20 vases on that display shelf makes it difficult to appreciate any of them”). Just having someone else present (your “body double,” a term coined by Linda Anderson) will help you to stay focused on decluttering. Let them hold up items that, if you touched them, might reinforce an emotional bond. Avoid working with anyone who has a “just throw it all out” mentality. Consider the value of investing in hiring a professional organizer. Look for one trained to work with chronic disorganization and ADHD through NAPO (National Association of Professional Organizers) or ICD (Institute for Challenging Disorganization). 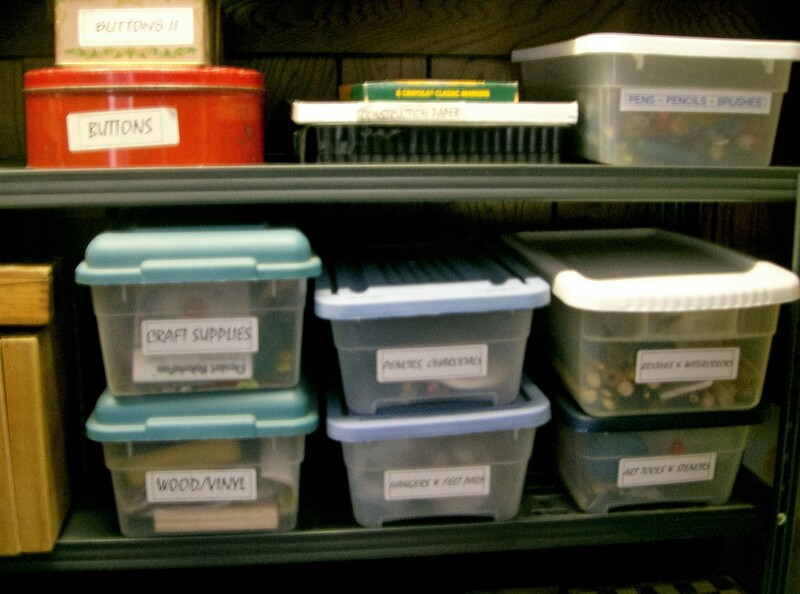 Getting organized doesn’t have to be painful. You CAN do it! Let go of the guilt and commit to taking baby steps — every success breeds success. Celebrate even the small accomplishments. You’ll feel energized and terrific, and your home will reflect your new approach!